One of the most recognizable things about Cleveland Cavaliers veteran guard J.R. Smith are the many tattoos on his body. However, after the NBA indicated that he’ll be subject to fines if he fails to cover up a particular tattoo on his leg, he went to social media to offer a blunt and profane rebuttal. Smith got the tattoo during the offseason, with the league edict being announced during the first week of the Cavaliers’ training camp. The team’s brief exhibition season begins on Tuesday night in Boston, with the first regular season game scheduled in Toronto on Oct. 17. The reason why the league issued its proclamation is financially based, since it has an apparel contract with Nike, while Supreme serves as one of that massive corporation’s competitors. With regard to the fine, there’s currently no indication how much the league plans on fining the 33-year-old veteran for each game the tattoo is uncovered. Sources on @TheAthleticNBA @WatchStadium: NBA informed Cleveland's J.R. Smith he would be fined per game during season for "Supreme" tattoo on his leg, unless it is covered, and Smith plans to have conversations with league about situation. 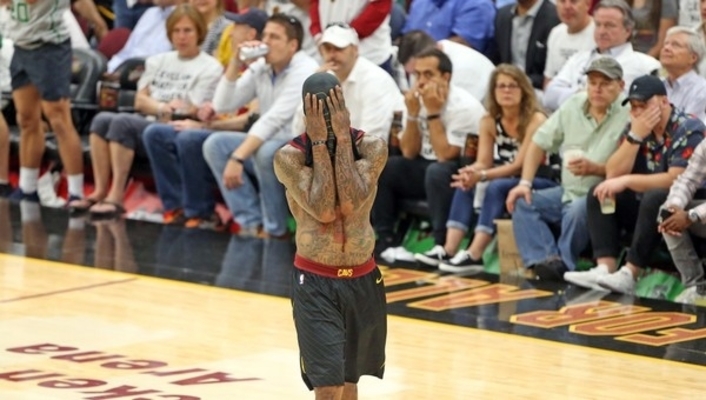 After the Cavaliers captured the 2016 NBA title with a stirring 3-1 comeback in the Finals, Smith was seen in multiple celebrations over the next week shirtless. That display of tattoos was enough for a shirt soon to be made to look like Smith’s tattoo-laden upper body. Smith has the type of contract that figures to allow him to pay off any fines, considering he’s scheduled to make $14.7 million during the 2018-19 season. Still, it seems more likely that Smith will eventually acquiesce to the league’s demand over what amounts to a minor issue.